Experience advanced picture enhancement and access content wirelessly with the BDP-S6700 Blu-ray player. 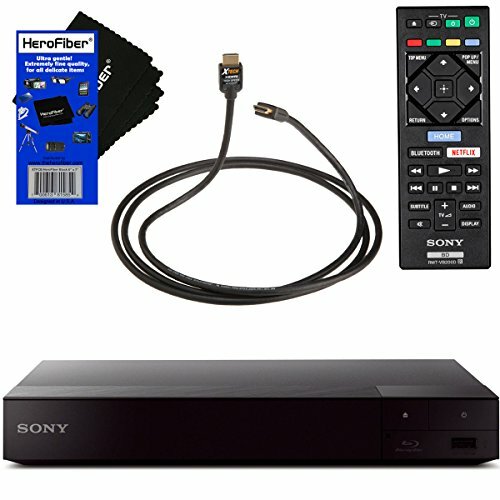 Enjoy your favorite movies upscaled to near 4K quality and connect wirelessly to Sony headphones, sound bars, speakers and more. What's more, with multi-room you can play CDs and other formats via USB wirelessly throughout your home. Access from 300+ entertainment services and upscale your content to near-4K quality. Enjoy stronger, faster Wi-Fi and mirror your smartphone screen on TV. You've never watched, listened or connected quite like this. Enjoy all the detail of the original recording in clear, high-fidelity surround sound with Dolby® TrueHD and DTS®-HD. DLNA allows you to share multimedia content across all supported devices in your home. Use your tablet or smartphone (Android or iOS) to control your Blu-ray DiscTM player, and learn more about what you're watching, with the Video & TV SideView app. Dimensions: (WxHxD) 10.1 x 1.6 x 7.6"